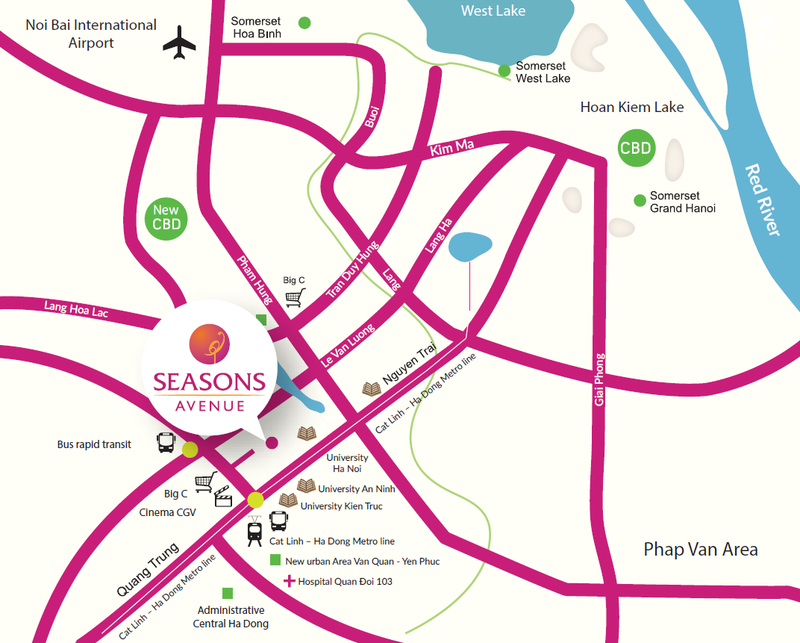 Seasons Avenue is located strategically at the border of Ha Dong district and the city new CBD. Just within 10 minute stroll, one can find Big C shopping mall, CGV cinema, Coopmart supermarket and 103 Military Hospital. In addition, the comprehensive and synchronized infrastructural development of Ha Dong district, from the Metro line Cat Linh – Ha Dong to the Bus Rapid Transit (BRT) system will render access to various parts of the city more convenient than ever. 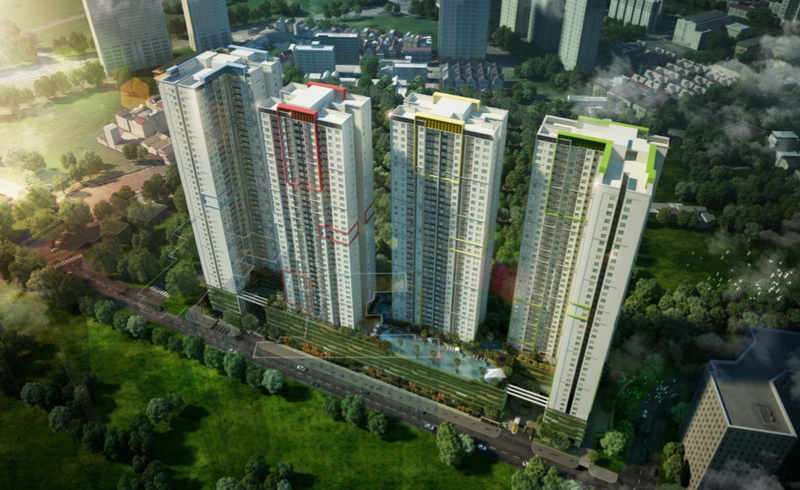 Segregated from the buzz of the business district, yet enjoying the increasingly developed infrastructures of Mo Lao and Ha Dong, Seasons Avenue captures the hearts of modern families looking for green and reclusive living space in the midst of the bustling city. It is conceptualized with a four season theme, a distinctive feature of Hanoi weather. As such, the designs of living space, green landscape and modern facilities are brought to absolute harmony in order to create a symphony of nature. Common space flaunts a vast array of top-notch innovative facilities and abundant greenery while each individual apartment is designed to maximize natural lighting and air ventilation without compromising efficiency. 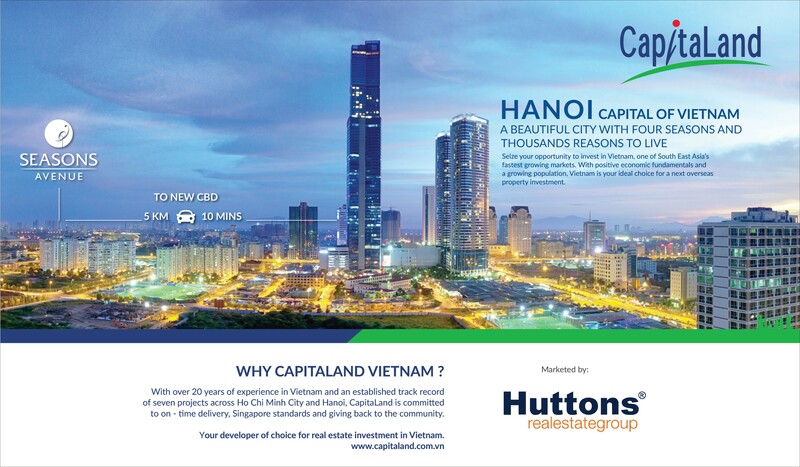 Developer: CapitaLand – Hoang Thanh Investment Co. Ltd.
For more information on Seasons Ave @ Hanoi Vietnam, simply fill up your details below and our salesperson will get in touch with you shortly!